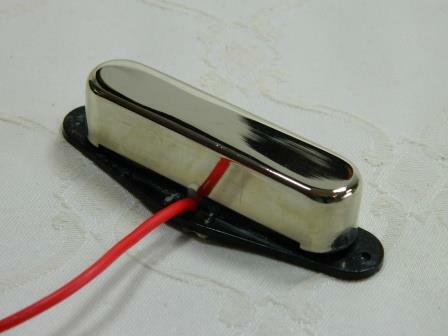 As with all of the range, the Ironstone Telecaster pickups are based on Alnico magnet pole pieces to guarantee vintage tone. 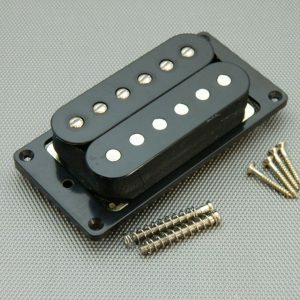 Unusually, the Bridge features Alnico V and Alnico 3 for the neck because different magnet grades perform better for different string positions and frequencies. 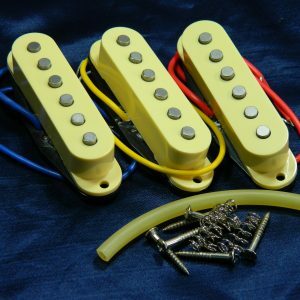 Aimed at the early 50’s and 60’s Tele tones, these feature the original specification of 42AWG windings for the bridge and 43AWG neck. They are available as individual bridge, neck or a set. 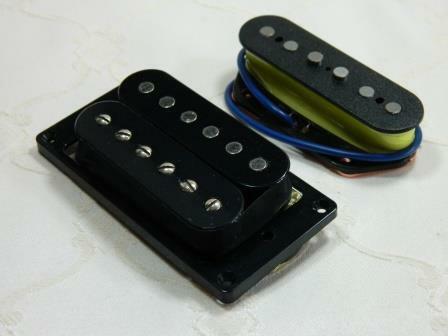 Additionally a set is available using an Ironstone Humbucker in place of the conventional Tele neck pickup. The tone is not so much an artist as an era! Think classic 50’s & 60’s, everything from rock to blues, jazz to country. Please note: The prices above and below are the UK total price including standard Royal Mail postage. Non UK customers will be advised of an additional small postal charge during the checkout process (see Shop page for current charges). 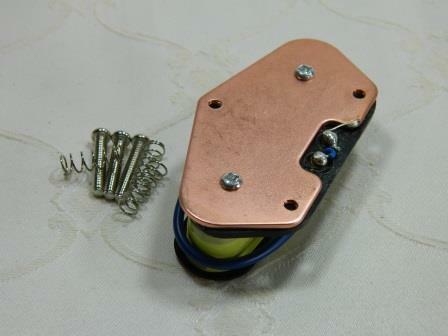 Vintage specification 7.2K Ohm Telecaster / Tele bridge pickup, featuring Alnico V magnet pole pieces and a rose copper baseplate. These combine to give an unrivalled warm, mellow tone palette. 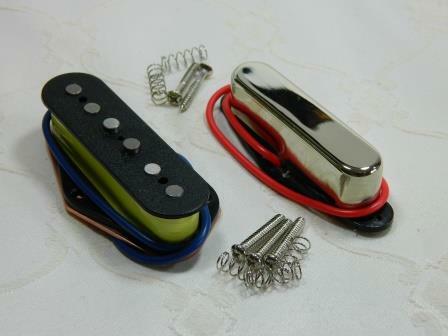 So along with retaining plenty of output, these pickups deliver the classic ‘twang’ of the early Telecasters. 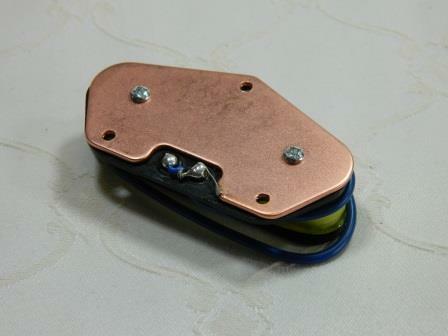 The base plate has a ground connection, key to reducing unwanted single coil electrical noise. 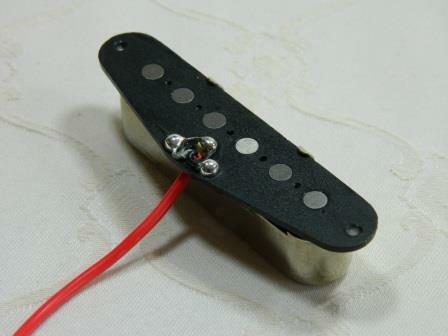 This pickup has lightly beveled poles at a 54mm pole spacing, with raised bridge D & G poles. Complete with all mounting hardware. *Left hand players please note: The Tele bridge pickups have symmetrical pole stagger allowing right or left hand usage. 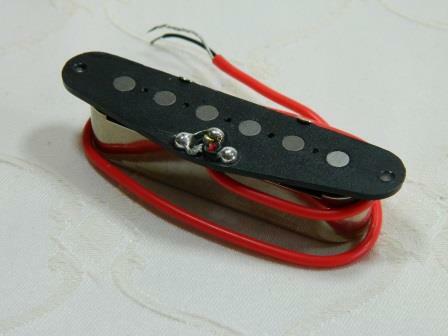 A Classic Telecaster neck using finer 43AWG wire (as the original specification) to make them really sing! Unusually equipped with Alnico III magnets (as the hugely respected Tonerider Tele hot Classics – renowned for their clarity), which give a tighter bass and stunning open sound and string definition. The controlled 7.2K Ohm configuration gives a real Fender 50’s / 60’s warm, full, yet clean bass tone palette. The classic Nickel-Silver finish grounded cover (vintage correct flat top and tight edge radii) surrounds a 50mm pole piece spacing. Supplied complete with mounting screws and springs. 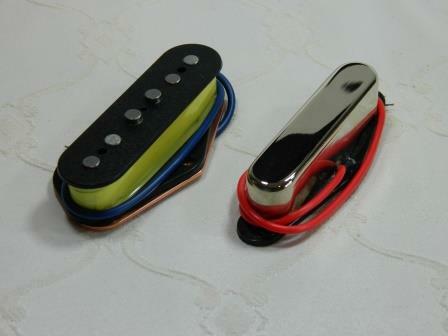 Individually and as a set, these pickups deliver Classic warm vintage tone, together with the renowned Tele ‘Twang’. 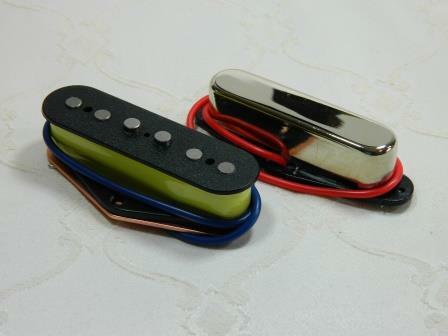 Suitable for a wide range of musical styles, these pickups are also featured as part of the Ironstone Telecaster control plate set (see link below). 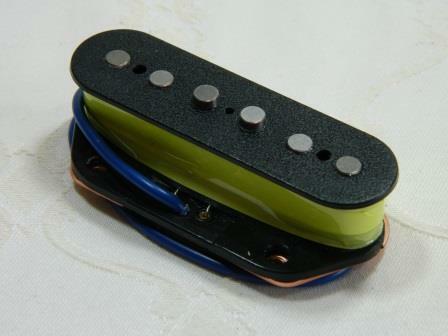 This adds two more switching options ( series and quasi ‘out of phase’) to the normal 3 way Tele configuration to completely exploit all the possibilities these pickups offer. 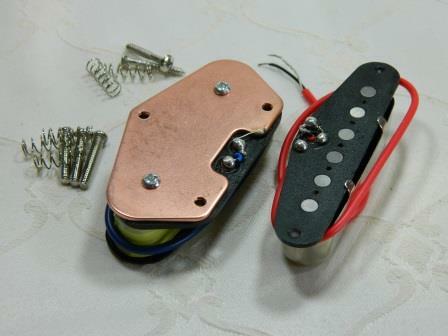 Both the bridge and neck pickups have solid wire links from the base plate / cover to the signal negative wires, so they are easy to modify for series or phase change switching. For all things Telecaster check out TDPRI , the world’s No.1 authority! It is indisputable that, despite being the original relatively easy and cheap to build electric guitar designed over 60 years, the Telecaster remains,with good reason, the best selling guitar design in the world. 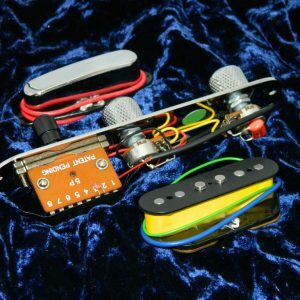 The bonus for would be owners on a budget is that, as a result of modern computer based building techniques, there are some excellent well made Telecaster type guitars imported from the Far East available at very affordable prices . I recently purchased a beautiful ash boded example which I am very happy with. Although the stock Chinese made ceramic pick ups were passable ,the sound improvement after installing a set of Ironstones was nothing short of amazing . As well as having a distinctive Tele tone they are very versatile and are excellent with both valves and digital amps and overdrive. When it comes to after market Telecaster pick ups, buyers are spoilt for choice of product with prices ranging up to well over £200 for a set. Do not be put off by the absolute bargain price of these. These seriously rock and are as good as any and better than most of the much higher priced competition. I can also highly recommend the helpfulness of the designer and owner. He had no hesitation in slightly amending the neck pick up wiring to suit my needs and make series wiring easier. As you know David, we always do our best to help and accommodate requests where its viable. The Tele is indeed a rather underestimated instrument in some circles, being only 2 pickup. But with a bit of clever switching, its amazing what tones are possible (especially if you are a pro player!). Bloody Hell What A Difference? Before I fitted the Ironstone pick-ups, I’d already changed the electrics in my Tele with a Suntan Mylar Tone Capacitor .022µf and replaced the pots with CTS 250k pots. They improved to sound with the original pick ups but they still sounded too trebly and too fierce for my liking. Once the pickups arrived, I took out the old ones, installed the new and what a difference! Depending on where the tone control is, the bass pickup can sound P90 like. If you’re after the sound of, Crazy Little Thing Called Love, by Queen, Another Brick In the Wall, Have A Cigar, by Pink Floyd and Paul Wellers, You Do Something To Me, this is it! Add an Overdrive, followed by a Compressor, as that’s the way I like to place them. An old black Marshall Gov’nor and an even older MXR Dyna Com, and it’s Les Paul, ‘Still Got The Blues’ sounding. Turn the Compressor up full and the notes hang on for ever. All that is on the bass pickup! 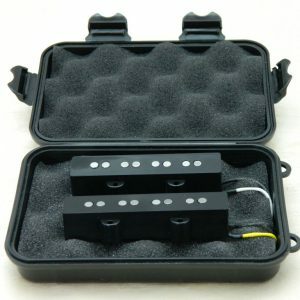 The Treble pickup still as the treble you’ll ever need but a lot ‘sweeter’ sounding. Turn down the tone and it thickens up nicely into a humbucker like sound, with loads of sustain. Beautiful sounds by the lorry load! Who needs a Les Paul? Telecaster vs. Les Paul…..interesting tone battle! Bought a second set of Tele pickups. A real musician was giving lessons to a friend of mine. Saw the guitar and asked to play it. He just had to have it saying the sounds were incredible! I told him where I got the pickups. All the way from England! So, like most who build things, there are things that they would like to change or do. The second one is done and the sounds are great! Just like the first one. I am absolutely blown away with these pickups, the clarity is amazing, my tech often swaps pups out for me, (typical “are these better”), I have tried pups from many companies but always they seemed to fall short in some ways, my tech called round today after fitting Ironstones to one of my Teles. Plugged in, instant WOW, everything I was looking for was there, I can’t find a tone I don’t like, not put it down for the last 3 hours, I’ve been back in the 50s for the afternoon. The balance is perfect, so perfect that I have listed my MIM Tele on a few sale sites, this one is a keeper, I have been following Ironstone for a while and I’m so pleased with these that I will recommend them to all my buddy’s.. Thank you Tony for some amazing pickups, you have converted me. Cheers, John. Thanks John. New converts (and their buddy’s!) always very welcome. Bought Tele pickups. Finally finished the guitar. Installed the pickups. Plugged in the power cord and…SILENCE! It was wonderful. Strummed the guitar in the center switch position. Wonderful! Strummed the guitar in the neck and then the bridge. Wonderful! That Tele sound was great! Hi, fitted these pickups to a new thinline tele and once again am delighted with the results, purchased these having installed a set of silver and a set of platinums in strats recently and cant see past this companies products.This is the first telecaster pups bought from ironstone and they are great , I think the neck pickup in particular sounds fantastic with the bridge one backing it up perfectly,well done once again ironstone. cheers. 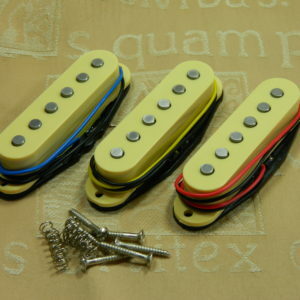 Bought a set of telecaster pickups for a Squier Affinity. They were easy to fit and really improve the sound of this guitar. Tony is great to deal with and is happy to help if you have questions. The pups look well made and arrived very quickly after ordering. At their current price, they are a no brainer for a budget upgrade and I like to support UK companies that do things right. Thanks for the compliments of course, and yes, customer service is a very big part of what I do here at Ironstone. I bought a Ironstone bridge and a strat silver neck pickups which I combined with a 4way switch, and added a trebble bleed. I’m amazed with these pickups. Powerful and at the same time clear. Very warm and full sound neck, very crisp bridge. In séries their great. Have to thank all the advice and suggestioneds Tony gave me. I’m very pleased. Extraordinary value for the price. These pups have breathed new life into my ailing and ageing Squier Strat. Can’t believe such great service and kit for the price. It’s now a pleasure, once again to pick it up and play. A great deal of trouble was taken to supply what I wanted as opposed to what somebody wanted to sell me. A truly refreshing experience, if you are looking for new pups you won’t go wrong with these guys. Bought a bridge pickup as a replacement for mine that had broken. Sounds excellent. Just the sound I was looking for. Would reccomend this to anyone. Don’t be put off by the price. There’s a difference between a value pickup and a pick that’s great value. These pickups are great value. They are beautifully balanced, with great attention to detail. (The extended D & G magnets on the bridge make a massive difference). Early eighties Japanese Tele, great to play but rather lacking any tone. I fitted the V and III onto a baja switch and turned this guitar into a smooth, warm dream that at a flick of a switch quacks, bites, growls or roars. They’re that versatile, absolutely delighted to have resurrected my beautiful guitar into a jack of all trades – master of all. model even has the same extended magnet pole piece beneath the D and G strings. I am also highly pleased that this exercise of chasing improved vintage tone was accomplished without any major expense. “I’ve fitted them (Ironstone Tele set) in a Tele thinline,now it sounds like a thinline !!!!! It had Duncan’s in it when I bought it !!!!! Why try and make a Tele sound like a Gibson ?????? The pickups are just what I wanted ,vintage sounds with a little umph !!!!! They are pretty well balanced in volume, the bridge being sparkling and bright without being harsh , a real problem with the duncan !!!! The neck is mellow, but not muddy, but you can still hear the woody tones !!! !